Golden euonymus (Euonymus japonicus) is an evergreen woody shrub with green and yellow foliage. This perennial plant grows in U.S. Department of Agriculture plant hardiness zones 7 through 9. 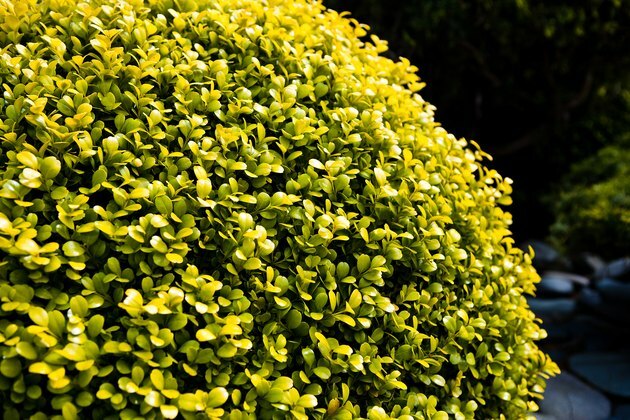 A golden euonymus needs minimal care once it is established. The shrub tolerates a wide range of soils and requires little fertilizer, though it may benefit from light feeding once or twice a year. Yellow shrubs add landscape color. Golden euonymus grows quickly, up to 2 feet a year, and matures at 3 to 6 feet wide and 10 to 15 feet high. The shrub tolerates a wide range of soils as long as the soil drains well. When the plant stands in water, it develops fungal disease. In damp climates, euonymus is prone to mildew and needs good air circulation. When the young shrub is initially planted or transplanted, add fertilizer by mixing organic compost into the existing soil. Golden euonymus brightens shade gardens and accents ground covers. Planted as hedges or foundation plantings, euonymus shrubs grow into a dense screen. This shrub, vulnerable to wind and sensitive to hot sun, thrives as a background plant near a protective fence or building. Euonymus adapts to poor soils in planters, driveway strips and landscape borders that do not receive regular cultivation. In these locations, organic mulch or compost applied around the shrubs minimizes water evaporation and provides slow-release fertilizer as it decays. Golden euonymus fills out quickly, but is not invasive, making it a companion plant for perennials and annuals. As it tolerates both sun and shade, this shrub makes an excellent companion plant to bedding plants, providing winter color when the flowers die off. It needs little fertilizer, so it does not compete with other plants for soil nutrients. In sandy and other soils with little organic matter, a time-release fertilizer specifically formulated for evergreen shrubs can be applied lightly in winter or spring. Time-release fertilizer is not suitable for summer feeding, as the bush responds with new late-season foliage susceptible to sun damage and frost burn. Golden euonymus fits into large containers, such as patio pots, ceramic entry tubs and wine-barrel planters. In these conditions, use a diluted liquid fertilizer in early spring and midsummer, as these fertilizers provide immediate feeding for container plants. Golden euonymus adapts to many soils and requires so little care that the shrub can suffer from water neglect. This plant adapts well to low-water conditions and should not stand in water, but does suffer dehydration in windy, drought or winter-dry conditions. Its water needs are low, but the plant suffers more without water than without fertilizer. When leaves dry or fall off, check the plant roots. Use a soaker hose or drip irrigation to give your golden euonymus a good drink of water. Repeat weekly during prolonged dry spells. Winter or summer, the roots need some moisture from nature or irrigation to keep the plant healthy.